The Amish, contrary to popular belief, are not self-sufficient. It’s easy to see why some might think Amish live in a bubble. They’ve been called “a people apart,” and sometimes described as “closed” and suspicious of outsiders. But as John suggests, Amish do in fact depend on non-Amish for many things. Here are five types of outsiders whom the Amish rely upon. Amish taxi drivers are simply non-Amish people with vehicles who provide transport services to the Amish. Every Amish community of size has people that provide this service. In the larger communities, you’ll find dozens of them. 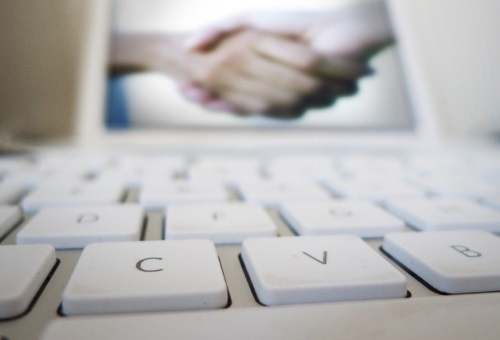 One of our readers recently wrote about picking up the job to fill a local need. We also heard the story of one driver with a 40-year career serving the Amish, while an anonymous taxi driver wrote to Amish publication Family Life on the pluses and minuses of the job. 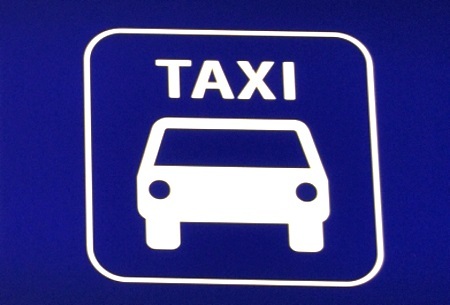 There are a handful of Amish who don’t hire taxi drivers except in emergencies. But besides them, most Amish make use of this service at times, for either local or long-distance travel. While more than a few Amish do follow unconventional health practices, nearly all rely on some degree of traditional care offered by English professionals, including optometrists, dentists, family doctors, and hospitals. Additionally, their animals need professional care, be it to treat disease, or in some communities, to provide services like artificial insemination of dairy cows. Since Amish formal education is limited to eight grades (plus limited supplemental training in some cases), they have to rely on outsiders for professional medical services. Amish businesses have had a lot of success, thanks to things like work ethic and commitment to making quality goods. But they also have to thank non-Amish people, who in many cases help them bridge the final gap between product and customer. This might be in providing marketing services, directly retailing products for an Amish wholesaler (common in the furniture industry), or helping an Amish business maintain an online presence. To take one example, an Amish builder friend has a website run by a third party. He receives monthly traffic reports updating him on on-site activity, with analytics showing pageviews and other metrics. While many learn business through apprenticeship, some Amish entrepreneurs even look outside their own communities for training–attending seminars or reading business books written or led by non-Amish people. 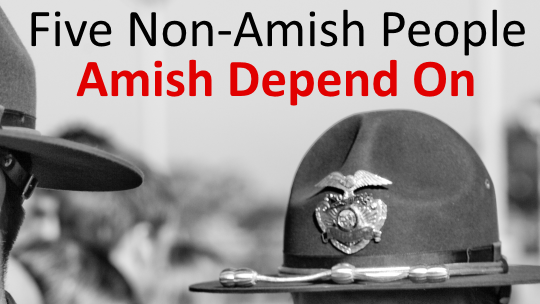 Amish interact with law enforcement in various situations. These include responses to buggy accidents or while investigating crimes committed against Amish. In one incident last year, Amish in western Pennsylvania provided female clothing to a male officer who posed as an Amish woman in hopes of catching a culprit indecently exposing himself. 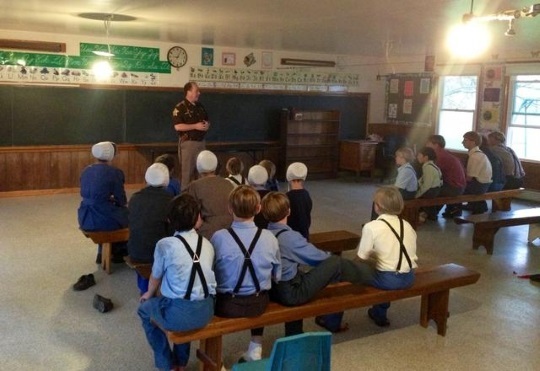 Earlier this year, law enforcement officers visited a Nappanee-area Amish school to discuss bike safety. The best-known example of Amish-law enforcement ties is probably found in the tragic Nickel Mines school shootings, and the relationships which developed afterwards. While some Amish businesses have mainly Amish customers–buggy shops or plain-clothing makers come to mind–many depend on outsiders for their earnings. Sometimes it’s obvious that your purchase is supporting an Amish family. Like when you buy direct from an Amish farm stand or variety store, or purchase an Amish-labeled product through a retailer. For example, when researching my Amish business book, I learned the story of Jonas and David Stoltzfus. The brothers run a Lancaster County leather goods business providing products for the Ralph Lauren luxury line. The reality is that Amish are less “frontier living” than some might think, and often rather plugged-in to the economy in 21st-century ways. And many survive and thrive thanks to non-Amish people who buy their products and services. The above noted, it should also be said that non-Amish people depend upon the Amish in numerous ways too. 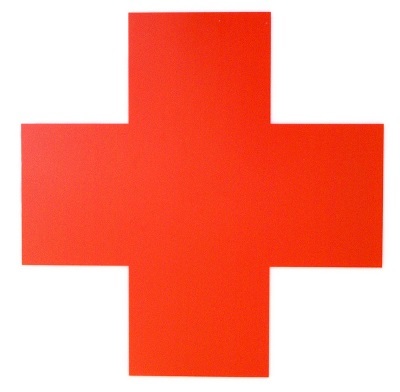 These include as providers of goods and services, as drivers of local economies (thanks to tourism and other business activity), and through community support (witness Amish aid programs in disaster areas, or local help for non-Amish neighbors). What other ways can you think of that Amish and English people depend on one another? They also must use the services of the undertaker. Amish Rely on the “English” for almost everything!!! In reality, the Amish rely on the “English” (non-Amish) for almost everything! Think about it. Let’s start with iron and steel. What farm could produce any crop without this vital product? Are there any Amish iron ore mines? Do any Amish produce modern (or any) steel, which requires a blast furnace/smelter, not to mention all the required associated technologies (i.e. liquid oxygen, cobalt, liquid nitrogen, complex electrical control systems, and so much more)? Pots, pans, spoons, knives and forks! Plow blades, nails, screws, bolts & nuts……anything made of metal(s). The list goes on and on….. bricks, cinder blocks, plastics, diesel motors, fuel…..propane, gas, diesel. Fertilizers, seeds, wood….. where should I stop? Everything!!! And, of course……the Amish Express (drivers), which, the Amish only want to pay $0.80-$1.00/mile of driving! But, the driver’s minimal cost is only $0.55-$0.75/mile!!! Frugal or just downright cheap!?!? I’m happy to pay whatever a driver charges me. AND tip for good service. The cheapest drivers are not always the good ones! Yep I rely on the American economy and manufacturing system… just like everyone else in this country. What I can produce myself I do, but I shop in local stores both Amish and not and order from catalogs and eat in non Amish restaurants, use non Amish doctors and the list goes on and on and on — but who is pretending anything else? Apparently some of the the people who “drive” the Amish are not very good at math! This is probably far-fetched, but I think that many of us have simple human curiosity about the other, and if both (Amish & English) are willing to get to know the other and ask a few respectful questions, it helps to keep outrageous “generalizations” from being spread. Funny about the Uber ad, but I was just wondering (before reading Jeff’s comments) if the Amish had discovered Uber (or LIFT, or others like them) for occasional use? If for nothing else than getting around places the Amish like to visit on vacation. Does anyone know? I might be wrong, but don’t you use the internet to connect with rides using Uber and Lift type places? That would not work for the Amish. They might even charge more than the usual English drivers. I haven’t used it yet but I think you need the app. Some Amish smartphone users would theoretically still be able to participate and maybe some have. I think Uber is more active in cities and highly populated areas though, so maybe an area like Lancaster County. Funny Eric 🙂 It is also Ironic that Uber is German…..
Again, not 100% sure…but I believe the cost for these rides are paid in advance by credit cards… though a debit card might be able to be used as well. Good point about the size of the vehicles Erik, unless this was an emergency for just a few people, it would be tough for it to work out. Truber is a brilliant idea! About 15 years ago or so my husband and I sold a piece of property and the buyer had a home built on it. We lived next door to the property that we sold. The boiler hired an Amish construction crew to come a.did some of the building work on the home. It’s a beautiful house and very well built . Let’s not forget the mailman and other delivery persons. My Amish friends get lots of letters and some magazines. They also order from catalogs for both personal and business needs. I was taken in until my parents were found and cared for as one of their own children. Although I think it is a rare thing they do, it happens. 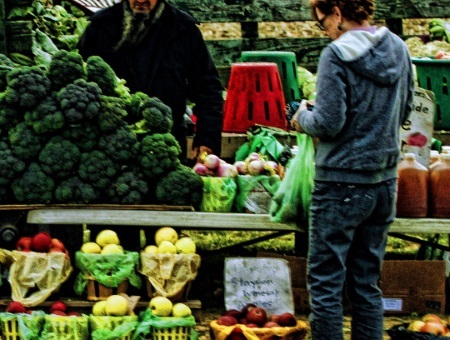 Also without the Amish locally we would have almost no local food…. I’ve not read too much of this happen, but your right, it does. There was a participant here on AA who had his own blog that detailed the life of a Mennonite family who adopted English children and raised them in that faith, it was an interesting read. I believe Richard passed that blog into the hands of another reader a few years ago, but not sure what has happened since. Richard of Amish Stories turned it over to Marilyn. The new blog host, Marilyn, sometimes comments on Amish America. Under very Restricted Conditions; those young Teenager People; obviously live on the Farms; to what I read; due to Teenage Behavior may on drive their Parents or other Trust Adults over age 18! Take that near Lancaster School Sooting; which happen right around the Events 09-11-01; why not have the Teacher have a Emergency Cell Phone in her/his Desk & have it chart up when Necessary! I respect their lives; they must have Initiative Circumstances prepainess; I’m not trying to change their Custom; Criminals have Ben known to Rent Farm Houses; Landlords hat they are Law Obeying Citizens! Amish regulate phone by district, they may call from an office phone on prem or use a work cell. Some sects and districts may be more restrictive so maybe a run to an English neighbor is required. Amish community “defines” communal living. A call for help would bring people running from multiple places. It is core to beliefs and culture to care for each other. This is how they self insure, rarely go bankrupt, and raise a Barn in a day or two. I agree a teacher should have an emergency cell, and I imagine they do now. Amish will way change and make exceptions to ordnong on a case by case basis when the good affects human life. Ten – fifth teen years ago a hurricane was coming to central PA so they hired harvesters. It was an exception, and the next year they went back to manual. Amish beliefs and culture raises them to live with trust in their God, family member, community, and fellow man. They know that there are bad people, and if they are robbed or assaulted they believe in non-violence. As a group they seem content on average, which beats many of us modern English. I respect the strong community & greater levels of trust they share.